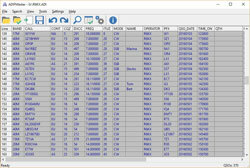 ADIF Master is a highly user configurable Windows application for working with HAM radio logbooks. ADIF is a generally accepted format for transferring logs between different Logging programs. ADIF Master does allow to convert any existing Cabrillo, TR, CT logs or a part of it into an ADIF file. Also you can use ADIF Master to open and modify existing ADIF logs using customizable filters; add, remove and modify ADIF tags and entries. What's new in ADIF Master? Implemented bandplan options for Make <FREQ> from <BAND> tool. Added prompt to save/quit before closing window. Improved loading and saving functionality. Added Make <CALL> Uppercase/Lowercase tools. Added multilevel Undo and Redo functionality. Added export to ADX format. Added support for Unicode logs. Added filters by Submode and Callsign. Added import from ADX format. Improved import from Cabrillo format. Updated Editor for bands, modes, and submodes. Implemented Setup Wizard with Uninstall support. Added support for high DPI displays on Windows 10.